The Halifax Media Co-op has obtained a letter from former Nova Scotia Minister of Energy - and current Member of the Legislative Assembly for Dartmouth East - Andrew Younger. 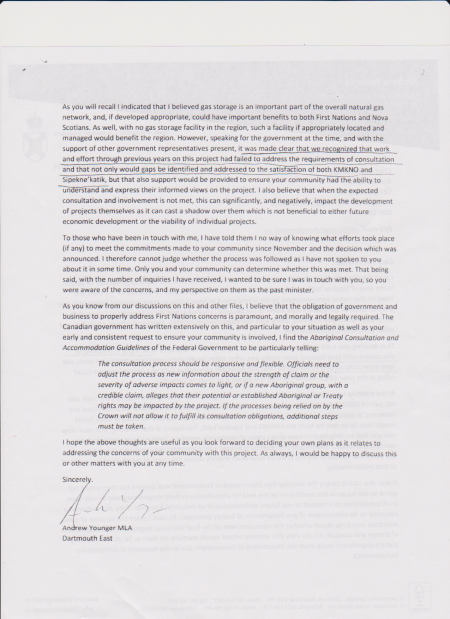 In the letter, dated January 26, 2016, and addressed to Sipekne'katik First Nation Chief Rufus Copage, Younger suggests that a community referendum over the Alton Gas storage cavern project, would have been "entirely within the range of possibilities" when Energy was his portfolio. Younger also expresses "surprise" at the fact that the Ministry of Energy appears to have taken the lead in issuing the highly controversial project its needed approvals, as normally approval-issuance and oversight is the purview of the Department of the Environment. Further, Younger expresses a degree of understanding of the fact that Sipekne'katik First Nation is not part of the larger consultative apparatus, known as the KMKNO, which claims consultative authority over the other 12 Mi'kmaq communities in Nova Scotia, and that arrangements would need to be taken between the provincial government and Sipekne'katik to fulfill the province's requirements in this regard. "Goverment recognized that Sipekne'katik was not part of the KMKNO for the purposes of consultation and negotiation, and therefore we understood any measure to satisfy the obligations to meaningfully involve, assist and consult Mi'kmaq in Nova Scotia would have to met for both the KMKNO and Sipekne'katik." Younger's words are a complete flip from the brazen position of current Energy Minister Michel Samson, who, although well aware of the desire of both Sipekne'katik and Millbrook First Nations to hold community referendums over the proposed multi-cavern project, on January 21 announced that the two Nova Scotia Mi'kmaq bands did not have the right to a referendum, and that the project would be moving forward despite their concerns. This bullheaded approach by the province - of issuing approvals to move forward on a project with questionable scientific credibility and the possibility of serious environmental repercussions - also appears to show no signs of slowing down. On February 18th, six individual groups, including Sipekne'katik First Nation, announced their intention to formally appeal the project with the Minister of Environment. The same day, current Environment Minister Margaret Miller retorted that the work will proceed regardless of these appeals, while she herself evaluates their merit. 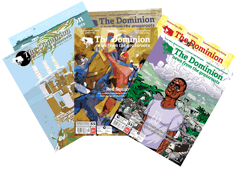 "It was made clear that we recognized that work and effort through previous years on this project had failed to address the requirements of consultation and that not only would gaps be identified and addressed...but that also support would be provided to ensure your community had the ability to understand and express their informed views on the project." For a full analysis of the Alton Gas proposal and all of its scientific and consultative pitfalls, click here. 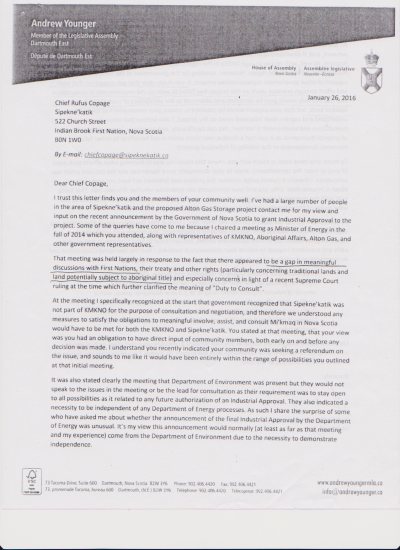 Andrew Younger's full letter to Chief Rufus Copage is included as a pdf attachment to this article. Underlines on the letter reflect the condition of the letter as it was received, and are not this author's doing. Submitted by chief wiggam on Fri, 02/19/2016 - 20:10.
great news . now the shubie band can be held responsible for their documented lies to the people and other communities. no more writing cheques to yourselves, or making out loans that are not payables for 99 years. your non- consideration of how other bands feel should be faced with condemnation. it is not "your" river. it is all mikmaqs. would you like the lobster or moose to be cut off from you? rufus stop being butchies puppet. Submitted by chief wiggam on Fri, 02/19/2016 - 20:26.
millwork needs to stop being "little shubie" and keep their own good name,rather than being drugged down in the mud with shubie.